President Donald Trump reportedly wants to replace his national security adviser, H.R. McMaster, with John Bolton, the former US ambassador to the UN, but he seems to not like Bolton’s mustache. In appearance, McMaster is much cleaner cut than Bolton and fits with Trump’s “central casting” aesthetic and appreciation for US generals. Rumours of President Donald Trump’s dissatisfaction with his national security adviser have swirled for months. But if Trump is truly thinking about replacing H.R. 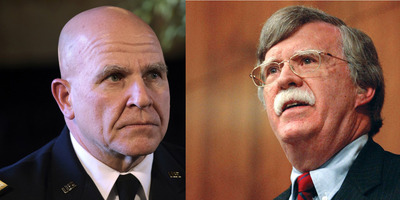 McMaster with John Bolton, the former US ambassador to the UN, as recent reports have indicated, Trump will first have to forgive Bolton’s prominent mustache. But there’s good evidence that one factor holding Bolton back from the job is his thick, white mustache. Trump reportedly does not like facial hair. None of Trump’s close associates have facial hair, a pattern dating back decades. Trump has repeatedly said he prefers to associate with people who appear to come out of “central casting,” or people who look the part in a Hollywood sense. But academic research actually backs up Trump’s apparent distaste for facial hair in his political associates. In 2015, Rebekah Herrick, a political-science professor at Oklahoma State University, published a paper called “Why Beards and Mustaches are Rare for Modern Politicians” that found voters didn’t like facial hair on political figures. In contrast, McMaster’s look couldn’t be any cleaner. McMaster, who remains on active duty, still dons his US Army uniform and hardly has a hair on his head. Trump has gotten flak from service members for calling his top advisers, including McMaster, Defence Secretary James Mattis, and the White House chief of staff, John Kelly, “my generals,” but he seems to have a genuine respect for the uniform and look of military men. On Thursday, after a torrent of reports that McMaster was headed out the door, the White House denied any impending staff shake-ups. Secretary of State Rex Tillerson, dismissed by Trump early this week, had been dogged by rumours of his weak standing in the White House for months before the news became final. McMaster may well stay in Trump’s Cabinet for some time, but if Trump can overcome his apparent distaste for Bolton’s big white mustache, he may he picked next for the role.